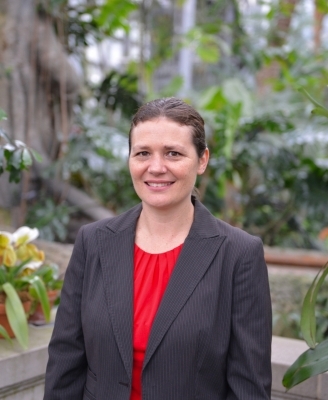 Washington, D.C. - The Architect of the Capitol announces the selection of Saharah Moon Chapotin, Ph.D., as Executive Director of the United States Botanic Garden (USBG). "Dr. Chapotin is a plant scientist with a passion to educate people about the importance of plants and agriculture," said Stephen T. Ayers, Architect of the Capitol and Acting Director of the U.S. Botanic Garden." As she leads the Garden in its efforts to connect people with plants, her vision and experience will guide the USBG as it approaches the 200th anniversary of its 1820 Congressional charter." She holds a bachelor of science in biology from Stanford University and a doctorate in plant physiology from Harvard University. Before her work with USAID, Chapotin completed fellowships at Iowa State University and the National Academies working on issues of biosafety policy, scientific communication and national security. Earlier in her career, she conducted forest ecology and canopy biology research throughout the United States, Madagascar and Costa Rica. The USBG has been in continuous operation and open to the public since 1850, and is dedicated to demonstrating the aesthetic, cultural, economic, therapeutic and ecological importance of plants to the well-being of humankind. The USBG collaborates with national and international partners to foster the exchange of ideas and information.